Apparently, the reflection of light off the water keeps the flies away. (It might be sensory overload of their compound eyes?) Make sure to hang the bag in the sun to get the best effect. I have not tried this, because we usually don't have much trouble with flies, but have seen it recommended on several sites. Let me know if you've tried it and how it worked for you. Fly traps are another great option to reduce fly populations. They contain an attractant that draws flies in, with a one way opening that keeps them in. 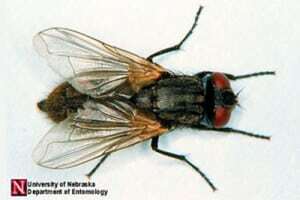 Use screens/caulk, etc, to keep flies out of the home, and utilize good sanitation to reduce breeding areas. Keep compost piles actively working, and cover soft food waste with rough/course plant materials such as leaves or grass. 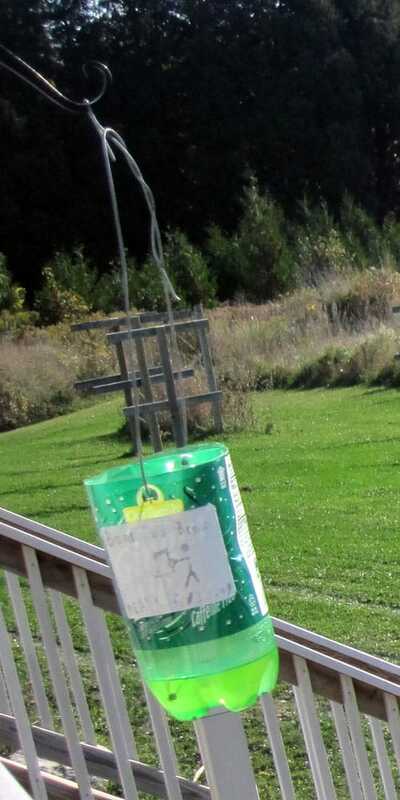 For biting flies that circle around the head (deer flies) that make a nuisance of themselves when you’re working outside or out camping and hiking, I recommend an old Boy Scout trick. Simply place a feather or other tall object on your hat. The flies are drawn to the tallest part of a moving target, and will circle the feather rather than your face. Catnip oil contains a compound that is 10 times more effective than DEET for deterring mosquitoes. It’s a very easy to grow plant, so I always have some in my garden. When I’m out working and mosquitoes start moving in, I grab a couple of handfuls of catnip and rub it all over my exposed skin. Mountain Rose Herbs and The Bulk Herb Store stock catnip essential oil (MRH only), dried catnip and catnip seeds (MRH only). It doesn’t get much simpler than this. 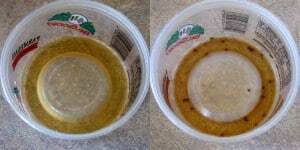 To make a basic fruit fly trap, take a small bowl or empty container (like a cottage cheese container). Place a small amount of fruit juice, apple cider vinegar or kombucha in the bottom of the bowl (about 1/8 inch). Put a small drop of dish soap into the juice, swirl it around gently. The soap breaks the surface tension so the flies go in for a drink but don’t come out again. My favorite juices to use for this are cantaloupe juice or tomato juice. Mildly fermented juice is even more effective. Left – fresh bait. 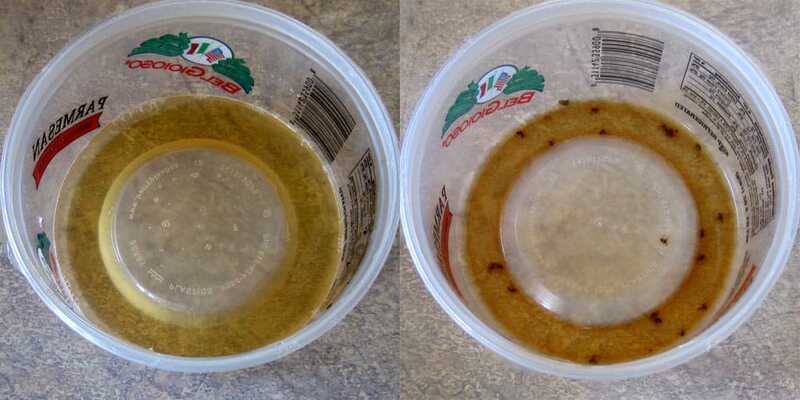 Right – next day, with most of the fruit flies now stuck in the trap. I don’t mind yellowjackets, in general. They tend to be quite docile, and they eat cabbage worms in my garden. However, when their population booms in late summer/autumn, they can do a lot of damage to ripening fruit and make themselves a real nuisance at outdoor events. For short term use, a simple yellowjacket trap can be made by taking a small plastic bottle, such as a 16 ounce water bottle, cutting off the top (about one inch into where the bottle widens below the neck), and inverting it into the bottom. Then place about 1 inch of sugar water (1 part sugar to 4 parts water – think hummingbird nectar) into the bottom of the bottle. Set on the table slightly away from the food. The yellowjackets crawl in, but can’t make their way back out again. For garden pests, please visit “DIY Natural Pest Control in the Garden” to get tips for controlling cabbage butterflies, potato beetles, cucumber beetles, squash bugs, slugs and other garden troublemakers. Remember, many commercial insecticides are potent neurotoxins – chemicals you don’t want anywhere near you or your food. Why Should I Bother with Non-toxic Home Pest Control? I want to kill the bugs. …the list goes on and on. Organophosphate pesticides readily store in fat tissue, so they stick around and keep causing damage. Standard pesticides don't just kill bugs – they can also kill us. Non-toxic home pest control is essential because standard pesticides can affect the body via both skin and inhalation. You don't want any sort of prolonged contact with organophosphate products. Any other quick and easy tips you'd like to share for the critters that are bugging you? Or maybe you're looking for ideas to ditch a pest? Leave a comment and share your thoughts. Thank you for this info. Now can you tell me how to get rid of roaches safely! Mary – I haven’t had to deal with them, but it looks like that book I linked at the bottom, “Least Toxic Home Pest Control” may have some ideas, and it’s pretty inexpensive. For roaches, boric acid is the classic non-toxic control. You spread it around the places where they crawl (in NYC, it’s poured into the walls). It gets on their legs, and they have to clean it off (because they breathe thru special pores in their legs), and it poisons them. You wouldn’t want young children to get into it, but otherwise it’s safe. I finally found the answer for roach’s…..boil one onion, 5 cloves garlic, 1 tablespoon cayenne pepper for 1 hr…..cool, strain and add 1 tablespoon Dawn dish liquid……….we spray each evening around the sink and along the wall they seem to be coming from…Works great. You always have great info and new ideas. Any thoughts on how to deal with spiders in the house? Thank you! How many and what type? If I’ve got a stray, I’ll often scoop them up and toss them outside. If I’ve been invaded by cobwebs (like in the basement by the woodpile), they generally get the broom and vacuum. Our house is pretty tight, so most come in with the wood or with garden produce. Apparently conkers around the window and door openings stop them coming In. I don’t know what’s wrong with the spray pesticides . . .twitch, twitch. Just kidding. I learned a lot here, a couple I’d seen but not all. Cinnamon has done wonders to rid the kitchen and bath of ants, it messes up their scent trail apparently. 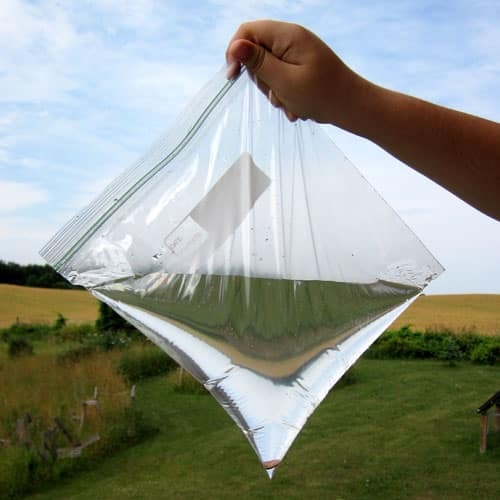 I have tried the water in a bag for flys and it didn’t work that great for me. For one thing, it’s hard to get the bag to stay put, but really, I couldn’t tell it did much at all. Hmmmmm…sounds like the fly traps are a better bet. I guess if something sounds too good to be true, it probably is. Funny, I saw the recommendation on several sites, with many people saying it had worked for them. We have used the water bags in our stall doors for our horses and it worked well. If you have trouble hanging them you can make a basic sling out of string (using just enough to support the bag for haniging). You don’t want to defeat the purpose of the bag’s reflection. Bags of water does not work. On the fly traps put 3 pennies spread out. 1 on each side and 1 in the middle. You can use gallon or quart ziplock bags. Use tacks or push pins to hang up evenly. The flies thing the pennies in the bags are wasps and they try to avoid them. After a while though the flies get used to it and you have to go to the fly traps which work great but hang them away from where you are outside becuase they get very rancid. [WORDPRESS HASHCASH] The poster sent us ‘2039932379 which is not a hashcash value. We get flies coming in our house a lot in the summer. I expected to have a good deal more this year with 2 the new neighbors 2 dogs. I thought I would try the bag of water trick (I heard to put pennies in it) by the outside door we use most often. Happy to say that this year we didn’t have any flies come in so I say it worked for us. Any thoughts on ticks and fleas? I have three four-legged part Germans ranging in age from a few weeks to 16 years. We are invaded with ladybug since 2 years during summer and they come into the house as soon as we open the door. We also have some during winter but no so many than summer. If you have a trick to get rid of them please advice me. Since we only have a few, I catch them and put them outside. Friends and family who have a ton of them in their homes vacuum them up. HOW DO GET RID OF RODENTS. MICE. AND KEEP THEM GONE. . I did a detailed post on rodent control at Wild Sage Homestead titled, “How to Keep Mice Out of Your Home and Garage“. Great advice from everyone. I enjoyed reading all of them. Several years ago we used the bags tied around doorways at Boy Scout summercamp and I’d say it worked to a degree. We made up fly traps like the ones talked about and had great success with them. BTW…I’m still looking for a cabin/small house in northern Mi. where I hope I can put to use some of your wonderful ideas. I’m still in Florida and trying some gardening ideas. A little different down here,however. I’ve grown bananas, blueberries,citrus,grapes ,tomatoes etc. By the time I retire I hope I’m not too old to enjoy some homesteading. I’m 61 now and hope to retire in a couple of years. Hi Jerry! Nice to hear from you again. I noticed a nice farmhouse went on the market recently about five miles from us. They have a very nice garden. I’ve admired it many times. Are you set on freezing your tail off in the UP? Odds are it is cheaper up there, but it sure gets cold.